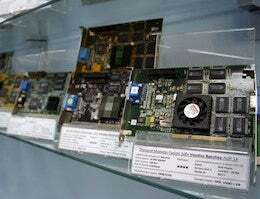 Ukrainian PC enthusiasts now have one more place to visit on their summer vacation this year, as a museum dedicated to the history of graphics cards is now open for all geeks to enjoy. The Kharkov Video Card Museum, which opened its doors in March of this year, now features over 200 graphics cards. As a nice nerdy touch, each of the graphics cards on display lists its specifications, its year of release, along with details of games that run particularly well on each card. Although the museum now showcases such a wide variety of graphics cards, its beginnings were far more modest. The museum's founder Alexander (also known online as SArd), got his first computer back in 1998. His very first computer had an S3 Graphics ViRGE/DX C graphics card within it. Ever since then, the PC gamer has gone on to collect more and more graphics cards. Alexander's collection grew over the years, and by the end of last year (2010) the idea to put on a private exhibition became a reality. The private exhibition, which was hosted in a local PC store, initially had around 35-40 of Alexander's own cards on display. Some of those visiting the graphics card showcase donated their own, with the collection growing to just under 50 cards before the exhibition came to a close. Following the success of the exhibition, work started on a more permanent GPU exhibit, which is what visitors can now enjoy today at the PCShop store. Those visiting the museum are encouraged to donate to the ever-growing collection, which is made all the more encouraging thanks to store discounts given to those who do.